One especially powerful feature of Adobe Edge Animate CC is the capability to add actions, triggers, labels, and cursor attributes to your composition. These tools are what you use to make your animation interactive so your audience can participate in what your animation is doing instead of having to sit there and watch passively. One of the actions you may want to add to an element in your Edge Animate project is to have it open a new URL. This capability is handy for creating menus or building links to other relevant content. You can follow this same basic procedure for most of the other actions as well. Select an element, right click and choose Open Actions For (as shown). After you click Open Actions from the menu, a blank coding box (the place where you type in your commands) opens. 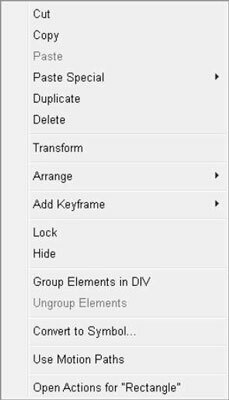 Right-click an element to open a large menu. From the menu on the right, choose Open URL. 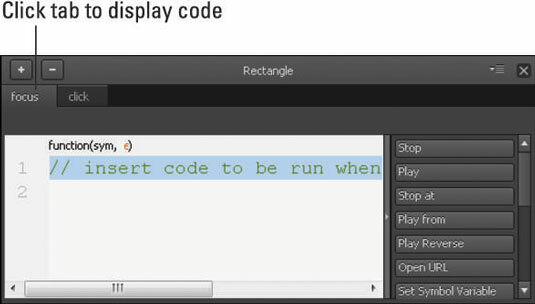 Edge Animate populates the box with code, as shown. By default, Adobe Edge Animate CC uses the URL to adobe.com when you click Open URL. If another destination for the link suits your purpose better, simply replace the adobe.com URL with a URL that goes to where you want to send your audience. To add an action to an element, with the Actions coding box open, click the + in the upper-left corner, as indicated in the figure. To remove an action from an element, click the –. When you have more than one action associated with a single element, then Edge Animate displays all of the actions in a tab view (as shown in this figure). Simply click the tabs to display the relevant code for each action. The Actions coding box looks like this with code in it. You can have more than one action per element. Update the URL within the code box, which is highlighted in orange text. Close the coding box to save your work. Preview your animation in a browser to test your work. To test to make sure that your link works, click the link with the mouse. On most websites, when you place your mouse over a link, the cursor changes from an arrow to a hand. Using the procedures described in this chapter, you can set cursor attributes to provide visual clues to your audience to indicate, for example, where links are or to show if you can select an element. If an element already has an action associated with it, then when you click Open Actions, Edge Animate immediately opens the coding box instead of the menu shown. When that happens, and you want to add a second action to that element, then click the + (as shown).